Uncharted system: Board derelict and investigate status. Mission located in Alpha-Quadrant with span: 4 and points: 35. Opponents requirement for solving this mission: Biology, Officer, 2 Treachery, and Strength > 36. 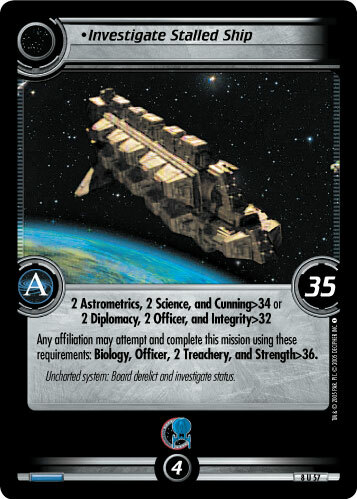 "Investigate Stalled Ship" is a backward compatible card form the Second Edition expansion To Boldly Go - ST1E compatible (Copyright 2005 by Decipher). See collectors infos for this card in the Second Edition section under the UCT-ID: ST2E 8 U 57. Also see here for all trade lists with any card fom "To Boldly Go - ST1E compatible".